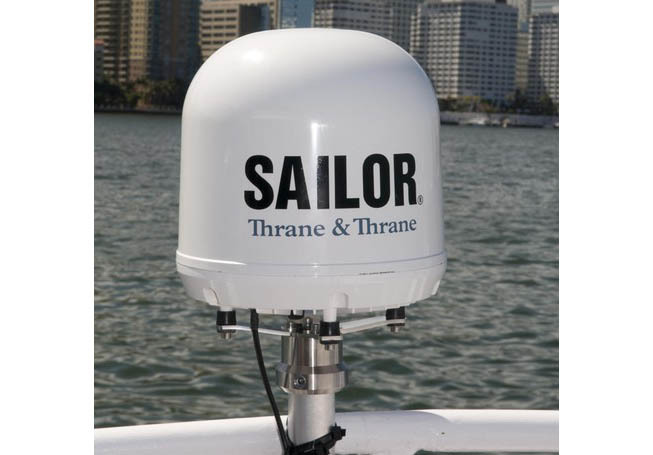 With data speeds up to 284 kbps from an antenna diameter less than 30 cm, which weighs just 5 kg, SAILOR 250 FleetBroadband is the perfect balance between form and function. Easy installation and the ability to provide affordable, high-speed access to internet/intranet and email, with voice calling and data simultaneously ensures professional communication possibilities for any vessel. SAILOR 250 FleetBroadband harnesses the power of global broadband at sea making IP communication a cost-effective reality, anywhere in the world. You can provide the means for crew to keep in touch with friends and family whilst reducing operational costs by improving vessel efficiency with reliable data and voice communication. SAILOR 250 FleetBroadband can be transformed into a highly flexible multi-station voice solution, without the need for a separate PABX, simply by adding additional Thrane IP Handsets. With its intuitive user interface on a 2.2” TFT colour screen and state-of-the-art echo canceller and noise suppression software for excellent call clarity, you can add up to 16 rugged plug-and-play handsets anywhere on a vessel. The mast mount kit interfaces to a 11⁄2” pipe (OD 48.3 mm). If the supplied plastic sleeve is omitted, a maximum diameter OD of 52 mm can be used.